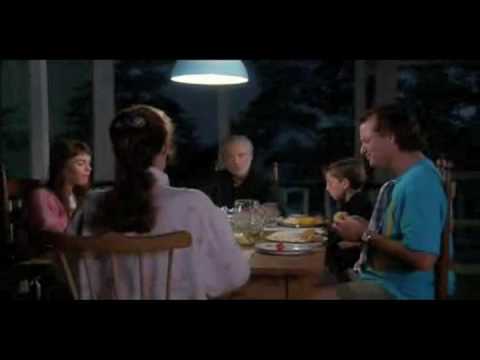 We watched What About Bob? last weekend – first time in quite a while, however far from the very first time watching. Definitely a show we’ve always thought was funny because of Bob Wiley‘s crazy neurosis and ease for finagling his way into Dr. Marvin’s family. However… while watching it again still made me laugh, I recognized some of myself in Bob Wiley… funny? Maybe, maybe not! The fact that I have identified my own neuroticisms and obsessions might give me more of an advantage over those who do not, but I’m not sure if Bob Wiley is a character with whom I wish to identify! In light of recent events this week (which were a mishmash of related and unrelated nerve-racking incidents), I pledge to not overindulge in thoughts and situations that give me anxiety! So here’s to days of relaxing, reading, sunning, some productive thinking, and enjoying planned and unplanned activities with friends and family. MY friends and family ahahahaha! 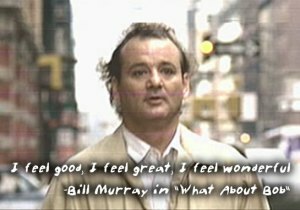 Posted by: tam Category: Discovery, Health, Life	Tags: anxiety, Bill Murray, Bob Wiley, Dr. Marvin, neurotic, Obsessions, Stress, What About Bob?